You know how much I love repurposing leftovers, cleaning out the fridge and freezer, getting creative with whatever I have on hand…this is one of those posts. Leftover steak + whatever veggies are in the fridge = a quick, easy and delicious dinner. Whole30 friendly, too! Remember, these ingredients can be substituted with whatever you’ve got! Get creative. Keep it simple. And enjoy! 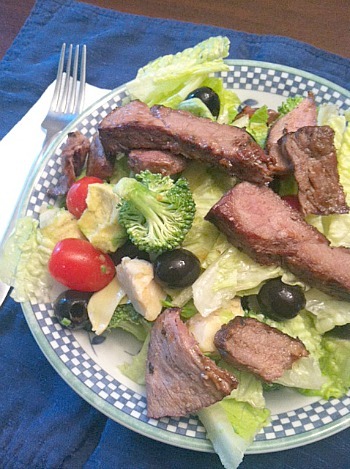 This entry was posted in beef, low carb, main dishes, QuickAndEasy, salad, Whole30. Bookmark the permalink. I’m intrigued by the Whole30 concept, which I heard first from you! The salad looks fantastic and you’re right – such a great way to use up leftovers and still be perfect for the summer season. It’s interesting, Joelen – a good way to cleanse yourself while eating food, not just drinking drinks. I plan on doing it again in a few months!